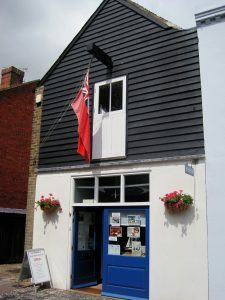 The museum portrays the changing history of Deal, Walmer and the surrounding area and is packed to the rafters with fascinating glimpses into the past. This year there is a new, permanent exhibition about the Royal Marines and Deal, which includes films, a dial up telephone with recorded memories of Royal Marines, Wrens & others and dressing up clothes for children. Upstairs there are 2 quizzes on Deal and Walmer, films about the East Kent Coalfield and displays about the local and domestic history of the town. For visitors with limited mobility, these can be seen on an iPad on the ground floor. The Maritime Gallery houses model and full-sized boats and information on local lifeboats and men. There is also a special display about the Deal men who went to Dunkirk. In the boatyard, there are more boats, fascinating gravestones and a first world war trench and film about the Deal men who participated in the war. There are tables and chairs and it’s a great place to have some refreshments.